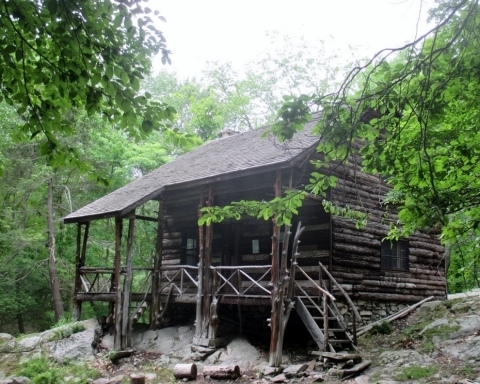 One of the most scenic wonders of our region is Kaaterskill Clove. 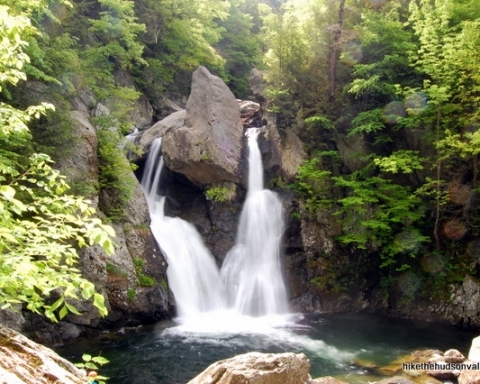 It is a breathtakingly beautiful canyon cut right into the Catskill Front. It is the sort of landscape feature that one normally associates with the great American West, but it is right here. There are trails which navigate hikers around the rim of this canyon, but for most, the easy way to enjoy the views is to drive Route 23A, up or down the canyon. It is a grand experience, any time of the year. You have probably driven the highway, but I don’t imagine that you put much thought into the bedrock cliffs that line the road. They are pretty; they contribute so much to the scenery, but think about them? Not many do that. Too bad, there is much to ponder here. Let’s take a ride up the clove. Our trip starts out at the western edge of Palenville. The highway crosses a bridge there and we get our first glimpse of the rocks. I would like it if you paid attention to your driving, so just give those rocks a few glimpses. You will quickly note large ledges of sandstone and that is about all you need to see here for now. You will very soon pass another huge cliff and then cross More’s Bridge. 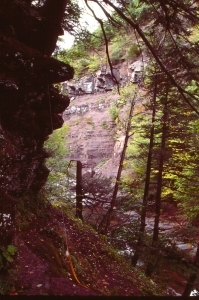 A quick look at the cliff will reveal, again, a sequence of red shale and brown sandstone. Now is the time to begin pondering what we are actually seeing. Keep heading up the canyon. Not too much farther up the road there are a couple of places where you can pull over, get out, climb down and take a more leisurely look at the rocks. Just across the canyon from the highway is something called the “Red Chasm.” Its name is well chosen because it is a very handsome shade of red. Take a good look and you will see thick layers of red shale. These were, long ago, formed as floodplain deposits. Then too, there are a large number of thick ledges of gray and brown sandstone. These were once the deposits of river channels. What you are looking at is an ancient delta. 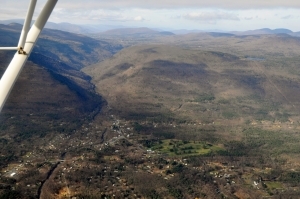 It’s called the Catskill Delta and back during the Devonian time period it boasted numerous rivers flowing across its surface. 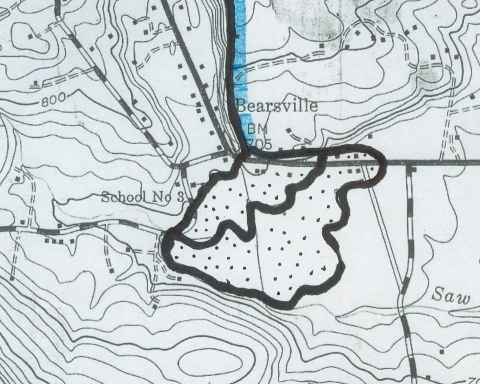 Floodplains and river channels; you have just learned about 90% of what there is to know about Catskills geology. As you travel throughout mountains, it is red shale and brown sandstone that make up most of the bedrock that you will encounter. And that will prove true for the rest of our drive up the clove. Each stratum of this sedimentary sequence represents a short chapter of time. Each had its turn being the surface of the Catskill Delta. The top of each red shale stratum was once the surface of the ground. If you could travel back through time then you could walk on that surface and leave footprints there. You could return to the present and go searching for your own fossil footprints. Too bad we can’t time travel, but we can’t. Not literally. Let’s continue our drive uphill. We will pass more outcrops of sandstone and shale. We gradually begin to appreciate how much time is involved here. Each horizon of rock really was the surface of the Catskill Delta for a brief moment, so long ago. 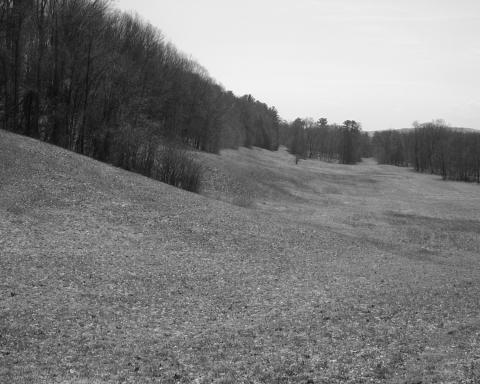 Each of those landscape surfaces would have, back then, had the look of permanence about it. But that look of permanence would have been deceptive. It is by driving up the canyon that we begin to “see” the passage of time. The strata, as we pass them by, record the history of the deposition on the Catskill Delta. They record time itself, a lot of it, and we are traveling through that time. Our journey up the canyon will eventually take us into Haines Falls, passing many more strata of sandstone and shale – and a lot more time. We will have passed by a thickness of about 1,200 feet of strata. Try to imagine, for a moment, how long it took for all that sediment to be deposited on the Catskill Delta. It must have been many hundreds of thousands of years and, quite possibly, millions – I do not know. But just how thick is the whole Catskill Sequence? 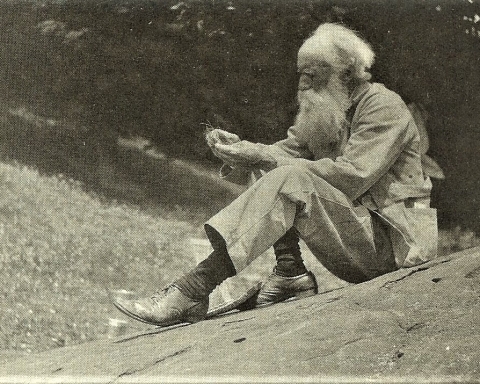 I asked Dr. Charles Ver Straeten, research geologist of the New York State Museum, and he told me that he had just made that calculation. 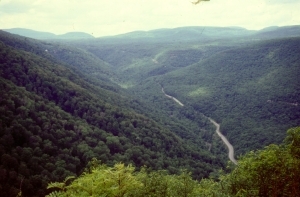 From the bottom of the Devonian sequence, in the Hudson Valley, to the top of Slide Mountain, there are about 9,000 feet of stratified Devonian sandstones and shales. I asked him how much time was involved in this same sequence and he gave me a chart that showed that, if we read it right, a bit more than 60 million years had passed while those strata were being deposited. 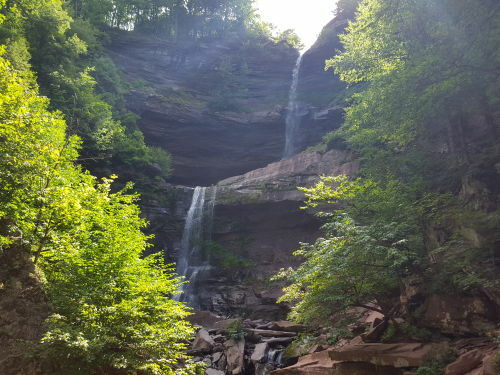 Our journey through Kaaterskill Clove seemed to have taken us through an enormous length of both rock and time, but it is perhaps only approximately one seventh of the Catskill sequence! Time, it would seem, is very long.